• The University at Buffalo women's basketball team will look for their fourth straight 3-0 start on Sunday night as they head to Eugene, OR to take on #3 Oregon at 5:00pm. • Buffalo put together their most impressive game of the season on Wednesday night as they handed the Niagara Purple Eagles a 88-61 loss. Prior to the game on Wednesday, UB unveiled a Sweet 16 banner in the rafters of Alumni Arena. • For the first time in school history, the Bulls received votes in the AP Top-25 Poll and the USA Today Coaches Top-25 Poll in consecutive weeks. UB closed out the 2017-18 season ranked No. 21 in the country in the final AP poll. • Senior shooting guard Cierra Dillard was named to the 2019 Citizen Naismith Trophy Watch list on Monday, awarded to the National Player of the Year. She was the only mid-major player on the list. The senior is averaging 24.0 points, 5.0 rebounds, 3.5 assists and 3.0 steals per game so far this season. 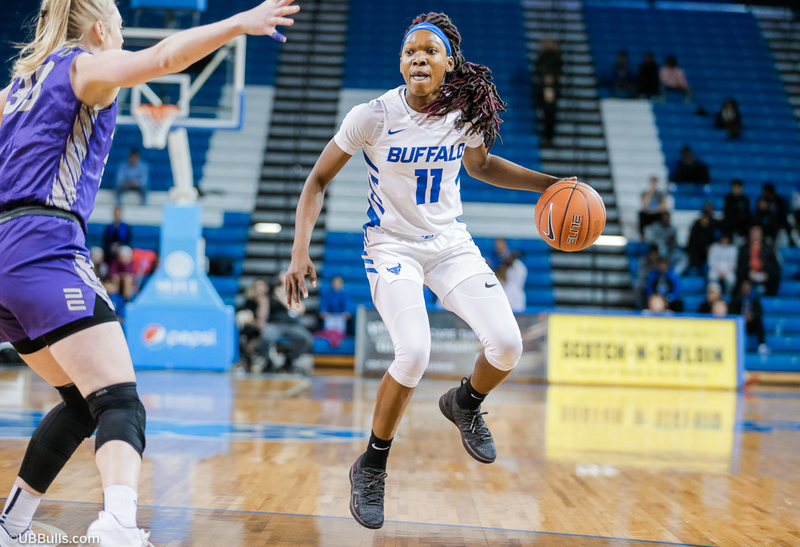 • The University at Buffalo women's basketball team had an impressive home opener on Wednesday night as they were able to use a high-powered second half attack to down Big 4 foe Niagara, 88-61. • On a special night inside Alumni Arena that saw the Bulls honor their historic 2017-18 campaign and team with the unveiling of a Sweet 16 banner, the youthful Bulls impressed the home fans with their energy and passion. 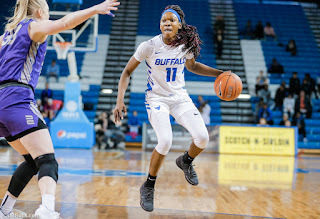 • Senior captain Cierra Dillard was the catalyst for the Bulls as she netted 17 of her 25 points in the third quarter to propel UB to their second straight win to open the season for the fourth straight season. Dillard finished the game going 9-for-17 for 25 points, six rebounds, four steals and three assists across 32 minutes. • The Bulls were effecient from the floor as a team as they shot a season-high 53.0% while outscoring the Purple Eagles 16-0 in the fast break category. • The #3 Oregon Ducks enter Sunday afternoons game against the Bulls with a 3-0 record as they have claimed victories over Alaska Fairbanks, #18 Syracuse and Utah State within an eight day span to open the season. • The high octane Ducks offensive attack is averaging 92.7 points/game while connecting on 53.1% of shots overall and 39.5% of shots behind the three-point arc. They are also averaging 20.0 assists/game while outscoring their opponents by an average of 37.0 points/game. • Oregon is led by junior Sabrina Ionescu who earned AP Preseason All-American honors after a great sophomore campaign last season. Ionescu leads the Ducks in nearly every statistical category this season as she is averaging 19.7 points, 10.3 rebounds and 7.0 assists while shooting 57.1% from the floor and 63.2% from behind the arc. • Ionescu opened the season with her 11th career triple-double as she finished with 18 points, 12 assists and 11 rebounds in the win over Alaska Fairbanks. The 11 career triple-doubles are the most in NCAA history as she broke the old NCAA record of seven in just her 44th game of her career. • As a team, the Ducks rank fourth in the NCAA in protecting the ball as they are averaging just 9.7 turnovers/contest while earning a 3-0 start to the season. • This marks the first time in school history that the Bulls earned AP poll votes and USA Today Coaches poll votes in consecutive weeks to open the season. • Senior Cierra Dillard was named to the Citizen Naismith Trophy Watch List on Monday afternoon. • She is one of 50 players on the list and the only mid-major player to earn a spot on the prestigious list. • Dillard also becomes the first UB player in school history to be named to the prestigious preseason Watch List. • Senior Cierra Dillard is in her final season in a Buffalo uniform and the ultra-talented guard has accumulated 1,397 career points across her stops with UMass and the Bulls. She finished off her first season in a UB jersey leading the squad with 566 points which ranked fourth in school history for points in a single season. • So far this season, Dillard has been nothing short of great for the Bulls as she has produced back-to-back 20+ point efforts in a pair of Buffalo wins. • The senior captain has led the Bulls in scoring in both games this season and for the year she is averaging 24.0 points, 5.0 rebounds, 3.5 assists and 3.0 steals while connecting on 48.1% of her shots including 41.7% from three-point range. • Dating back to last season, Dillard has produced six straight 20+ point games and is averaging 26.8 points/game over that span. • Across her career, Dillard has produced at least one steal in 35 of 37 games and recorded multiple steals in 29 games. She also set a career-high with seven thefts in a win over Toledo (1/20/18) last season. • The crafty passer has recorded at least one assist in each of her 37 career games while recording 5+ helpers 21 times a season ago. She also led the team in assists 16 times during her UB career. • Dillard has led the Bulls in scoring 21 times since joining the program while going over the 20-point plateau a team-high 13 times. The Bulls owned a 11-2 record when Dillard scores 20+ points. • Senior sharpshooter Courtney Wilkins will be relied on heavily this season to step up and score the ball on a more consistent basis and she definitely has embraced that role through two games this season. • Earning her second straight start, Wilkins was a difference maker for the Bulls as she was able to net 13 points with a career-high seven rebounds across 27 minutes of work. The efficient Wilkins finished the game going 5-for-9 from the floor while hitting one triple. • Junior wing Theresa Onwuka has been a strong bench player for the Bulls across her first two seasons with the squad but she has been asked to serve as a starter this season and is really embracing her new role. • Onwuka is enjoying a strong start to her junior season as she ranks third on the team averaging 9.0 points, 2.0 steals and 1.5 rebounds while going 7-for-8 (87.5%) from the floor on the season. • Senior power forward Brittany Morrison has been relied on heavily early on this season as she is filling in for the void left by the graduation of Cassie Oursler. • The North Ridgeville, OH native has stepped up and earned the right to big minutes down low for the Bulls as she continues to grow into a leader for a young frontcourt for UB. • So far this season, Morrison is averaging 8.5 points, 6.0 rebounds and 1.5 assists while shooting 54.5% from the floor and grabbing a team-high five offensive rebounds. • Last time out, Morrison earned the start at center for the Bulls and produced nine points, six rebounds and three assists across 21 minutes of action in the win over Niagara. • Hall returns for her second year with the Bulls and looks poised to take over the starting duties after earning the start in each of the Bulls' two victories this season. • The Hamilton, ON native is averaging 19.5 minutes, 3.5 points, 3.0 assists, 3.0 rebounds and 1.0 steals per game so far this season while starting both games at the point for UB. • Last time out, Hall had her strongest effort defensively of the season while also filling the statsheet. The sophomore finished off the win over Niagara with four points, five assists, four rebounds and two steals across 21 minutes of work while forcing the Purple Eagles point guard to commit six turnovers in the game as she played great defense on the dangerous guard. • After graduating five players including three starters from last seasons Sweet 16 squad, the Bulls will be relying heavily on a seven-player recruiting class this season. • Freshman Keowa Walters made the most of her playing time on Wednesday night against Niagara as she came off the bench and posted six points and four rebounds across just five minutes of action while going 3-for-5 from the floor. • Adebola Adeyeye had an impact off the UB bench against Niagara as she finished off the win with four points, two offensive rebounds and two steals across a career-high nine minutes. • The other four UB freshman, Finess Dickson, Aireal Dickson, Oceane Kounkou and Alexis Adams each played for Buffalo on Wednesday as they continue to learn valuable lessons and grow into collegiate players. • Last time out, the Buffalo offense came alive in the second half against Niagara and they finished off the game with a season-high 88 points, including 51 in the second half. • The Bulls are tough to beat when they scored 80+ points as they own a 16-2 record dating back to last season when doing so. • The wins continue to pile up for the Bulls under head coach Felisha Legette-Jack as they produced their third straight 20+ win campaign last season, setting a school record with 29 victories. The Bulls surpassed the previous school record of 23 wins which was set in 1996. • Ever since taking over the program seven seasons ago, head coach Felisha Legette-Jack has prided herself on having a team committed to defense and that is no different this season. • The Buffalo defense has been great early on this season in causing turnovers from their opponents as they are forcing an average of 26.0 turnovers/game across a pair of wins. • As a team, Buffalo leads the MAC and ranks 18th in the NCAA forcing turnovers so far this season. • The Bulls are also averaging 12.5 steals/game so far this season while netting an average of 22.0 points/game off of opponents turnovers. • Last time out, UB forced Niagara to turn the ball over a season-high 29 times as they cruised to a 88-61 victory. • UB has continued their strong play in the open court as they have outscored their opponents 18-4 so far this season in a pair of wins. • Last time out, Buffalo won the fast break category 16-0 over Niagara as they have now held 10 opponents to no fast break points scored in a game over the past two seasons. • Over the past three seasons, the Bulls have won or tied the fast break category in 60 of their 68 games including in 49 of their 53 wins. • Last time out, the Bulls had their best shooting performance of the young season as they went 35-for-66 (53.0%) and went 60% from inside the three-point arc. • Over the past two seasons, Buffalo is 26-0 when shooting a higher percentage from the floor than their opponent and are 59-2 across the past four seasons when doing so. • Seniors Ayoleka Sodade and Brittany Morrison have made a major impact on the Buffalo program since they arrived in 2015 as they have combined for 73 wins over their career's including two NCAA Tournament appearances and advancing to the MAC semifinals in each of the past three seasons. • Redshirt senior Courtney WIlkins has been around for the most wins on the roster as she has seen 92 Buffalo victories since joining the Bulls prior to the 2014-15 campaign. advancing to the MAC semifinals in each of the past three seasons.